Less than a month after the iPad release of the Pokémon Trading Card Game, The Pokémon Company returns to iTunes with Camp Pokémon, a free collection of kid-friendly mini-games that'll give fans something to fool around with while waiting for Alpha Sapphire and Omega Ruby to come out. 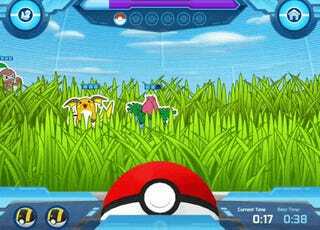 Set on a Pokémon-themed island, Camp Pokémon is almost more a set of training exercises than proper games. There's a game that involves identifying Pokémon in the wild, scanning a 360 degree arena with the tip of a finger. Poké Ball Throw sees players flicking balls at marauding Pokémon to collect their corresponding pins. Pokémon Evolutions tests player's knowledge of pocket monster transformations. Pokémon in Focus is a simple game that involves picking out a pocket monster from its silhouette. Battle Matchups tasks players with picking out which Pokémon possesses an element stronger than the one being displayed. And finally there's the Photo Booth, which is just an excuse to post a picture of my son, Archer. By achieving high scores in the mini-games, players will unlock new levels and eventually figure out what's so mysterious about the Mystery Cave, an area currently locked in my version of the app. It's no full-on Pokémon role-playing game for the iPhone/iPad/iPod, but any app that puts officially licensed Pokémon on my phone or tablet for free is welcome in my app-space. Camp Pokémon is available right now on iTunes.